Kimi Raikkonen hopes a major upgrade on his Lotus car will revive his dwindling title hopes. The team have a new exhaust, similar to that used by McLaren and Ferrari, which should make the car faster. Raikkonen, third in the championship, said ahead of this weekend's Korean Grand Prix: "We have some [simulation] numbers from the wind tunnel. "We have some high hopes but until we run those things on the circuit we are not 100% sure they will work." The 32-year-old Finn is 37 points behind championship leader Fernando Alonso of Ferrari with 125 still available in the remaining five races. He owes that position to consistency. Although the car has been among the quickest on race days for much of the year, Raikkonen - who won the world title with Ferrari in 2007 - and team-mate Romain Grosjean have yet to win a race. Raikkonen's hopes have been hit by a relative lack of performance in the four races since he finished a close second to McLaren's Lewis Hamilton in Hungary at the end of July. "We do everything we can but we have to improve and we haven't scored very good points on the previous races," Raikkonen said. "But we have still been scoring points and keeping ourselves in the championship. "We still have chances and if we can be faster here than in the previous races we might put ourselves back in a better position." The new Lotus exhaust design is based on an idea pioneered by McLaren and Ferrari at the start of the season, and since adopted also by Mercedes and Force India. It directs the exhaust gases at the area where the floor of the car meets the rear wheels, improving airflow and therefore aerodynamic downforce. It is nowhere near as powerful as the so-called exhaust-blown diffusers pioneered by Red Bull in 2010, and which were said to be worth as much as 1.5 seconds a lap. But it is thought to be worth 0.2-0.3secs in pace. 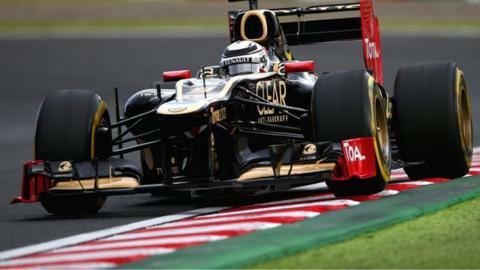 Only Raikkonen of the two Lotus drivers will have the system in Korea this weekend. The team will try the new exhaust on track for the first time in Friday practice in Korea but BBC Sport understands that, unlike other developments trialled in practice sessions this season, they expect to race it as well this weekend. First Practice 01:55 BST; Red Button and online. Second Practice 05:55 BST, Red Button and online. Third practice 02:55 BST; Red Button, 5 live Sports Extra and online. Qualifying 06:00 BST; BBC One (from 05:00), online and BBC Radio 5 live Sports Extra (from 05:55). Qualifying replay 13:00; BBC One. Race 07:00 BST; BBC One (from 06:00), online and BBC Radio 5 live (from 06:55). Race replay 14:00 BST; BBC One. Highlights 19:00 BST; BBC Three.